Our work consists of supporting companies, social organizations and governments in order for them to develop inclusive business models and projects to support low-income microentrepreneurs, expanding access to knowledge, networks, markets and credit so that they can start or develop their businesses. We create business, work and income generation opportunities via entrepreneurship, promoting social and economic inclusion and development. Planning, execution and evaluation of projects that aim at supporting low-income micro-entrepreneurs in order to develop their entrepreneurial and management skills and to enlarge their access to knowledge, networks, markets and credit. We build the projects together with our partner in a collaborative way, always focusing on the direct impact that they may have on the lives of the supported micro-entrepreneurs. Consulting and implementation of inclusive businesses models that may transform traditional value chains into fairer and more profitable chains by including low-income microentrepreneurs. With this in mind, we work together with large companies in order to create business models and opportunities that are both profitable and socially impactful. The process begins with researches that aim at identifying these opportunities and it involves the design, the planning, the implementation and the evaluation of each models developed. 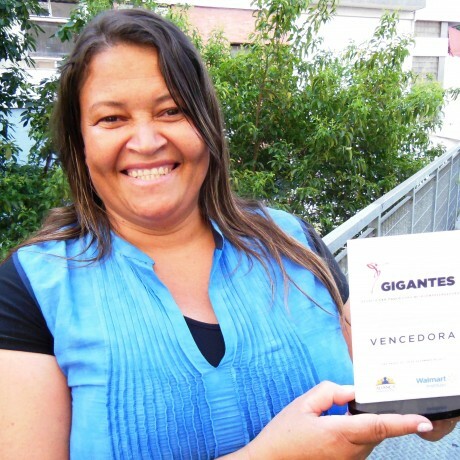 Aliança Empreendedora was one of the first organizations to develop this work-model in Brazil, which allowed us to create initiatives together with companies from many different areas, such as cosmetics, wholesale, recycling, furniture and food industry. Some of the companies we worked with are Natura, Danone, Santander, Instituto Coca-Cola, Masisa, Gerdau, Serasa Experian, A Gente Transforma – Marcelo Rosenbaum e Unilever. In Brazil, most people believe that in order to be an entrepreneur, one has to have a gift or be born one. Because of that those interested in opening small businesses do not look for support in order to enable their projects. So as to change that, Aliança Empreendedora works on spreading the message that each and every one can be an entrepreneur by learning a new set of skills. One way to do that is by distributing awards – national and international ones – that inspire microentrepreneurs to tell their stories and disseminate successful examples, contributing for the low-income entrepreneurs’ empowerment. We also give consultancy and produce content for TV programs and video producers in order to disseminate the cause. Our main case in this area is the segment “Mandando Bem”, aired on the program Caldeirão do Huck, which resulted from a partnership between the show and Aliança Empreendora. We work with a dynamic methodology that is based on andragogy (adult education), grup dynamics and in a theory called Effectuation. Andragogy takes into account the participants’ life experience and uses problem solving and the immediate application of whatever is learned as motivation. Using concepts from group dynamics, our trainings are always planned for groups and they follow a humanistic approach, which says that human beings are able to find solutions for their problems and can change their own behavior in order to obtain different outcomes. The Effectuation theory, which was developed based on researches made by Dr. Saras Sarasvathy, see entrepreneurship not as a gift or a group of characteristics, but as a set of skills that are developed through practice and experience. 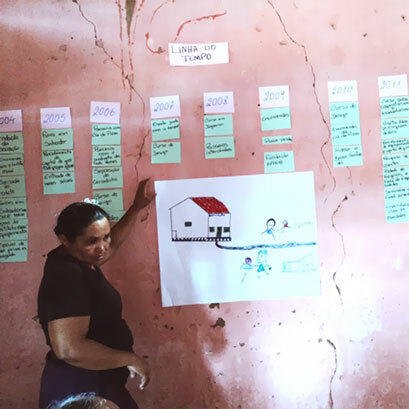 Instead of focusing on making a business plan based merely of predictions, Aliança Empreendedora’s methodology uses the Effectuation theory to stimulate microentrepreneurs to develop or improve their own businesses starting with what they already have. We work with three essential concepts: 1 – Who they are (identity, dreams, self-image); 2 – What they know (knowledge and experience); and 3 – Who they know (network). The Effectuation theory was chosen not only because it’s simple, but also because it is very efficient when dealing with low-income microentrepreneurs, who generally start their businesses with “whatever they have”. Our methodology is divided into five different types, each one relating to a specific audience. All types are applied using accessible language, so as to be understood by any microentrepreneur, regardless of their schooling. The Entrepreneurial Journey is focused on individual microentrepreneurs that already have an operating business (actives) or that want to start their own businesses (beginners). It proposes achievable challenges that bring quick answers to the participants’ doubts and work as “fuel” for entrepreneurship, combining theory and practice in order to meet the microentrepreneurs’ needs and interests. For beginners the methodology provides for a cycle of meetings in which the microentrepreneurs evaluate their own characteristics, their knowledge, their network and the resources they have, in order to choose one or more business ideas with which they will work with throughout the training. 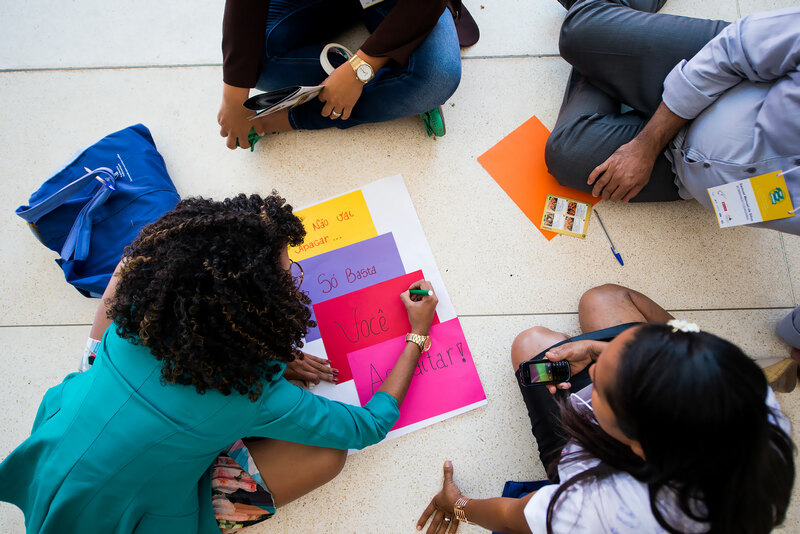 For active microentrepreneurs, the training consists of meetings called “Solution Cycle”, in which the participants determine, according to a self-evaluation, what are their main problems, doubts and difficulties to be overcome. At the end of the cycle, the microentrepreneurs will be able to assess the problems their businesses’ have and search for solutions for them. The Entrepreneurial Climbing focuses on productive community groups and it’s certified by Banco do Brasil Foundation as a “Social Technology”. During the meetings, the members of each group develop an entrepreneurial behavior, solve conflicts and overcome challenges, as they expand their access to knowledge. The training includes the elaboration of a simplified business plan and of a strategic planning. According to each group’s needs and interests, the meetings also cover themes such as Conflict Resolution, Price Formation, Registration, Internal Communication, Basic Administrative Controls, Partnership and Fundraising, Human Resources, Local Development and Sales. The Entrepreneurial Climbing can also focus on individual microentrepreneurs or productive groups who want to develop or expand social business in their communities, generating profit as well as social and environmental impact. This methodology was developed by Aliança Empreendedora together with Artemisia. The training includes the elaboration of a simplified business plan by each productive group, as well as lessons and discussions about the following subjects: Values; Passions and Talents; Economic Entrepreneurship; Mapping Demands and Needs of Communities; Opportunities Business Analysis and Social and Environmental Impact; Definition of Products and Services; Chain Providers and Distribution; Analysis of Clients, Partners and Competitors; Marketing; Costs and Pricing; and Cash Flow. Apart from that, the participants also develop a strategic planning. The Inclusive Recycling was developed to support recyclable waste pickers’ organizations in order to structure and strengthen these organizations by improving their production, management and marketing processes, turning them into sustainable, self-managed, empowered and socially and economically included organizations. The ultimate goal of the process is to enable the “pickers” to sell the recyclable material directly to industry, cutting the middlemen in the process. The methodology is based on a thorough diagnosis of pickers’ organizations, which highlights the main actions that need to be undertaken. It has accessible language, good practices and examples closely related to recycling, so that the pickers are able to apprehend the concepts and the processes related to: Associative and Cooperative Management; Market for Plastic, Paper, Glass and Metal; Productivity, Accountability and Transparency; Sales and Financial Control; Formalization; How to Search and Connect with Partners, Customers and Governments; among others. Creative has as its main objective to teach low-income microentrepreneurs and give them access to creative design tools and techniques that may help them to create or improve their products and services. The trainings are divided into levels (beginners, intermediate and advanced) and in each meeting the participants are made aware of the importance of improving their products and they learn how to use a new creative tool, practicing on their own productions, improving and innovating them. Some of the themes studied are: Product Ideas; Analysis of Similar Products; Cultural Identity in the Product; Visual Identity; Style; Color Combination; Trends; EcoDesign; Design Services and themes structured to meet the specific demands of the entrepreneur. All of our trainings directly impact the microentrepreneurs’ behavior. Because of that, evaluating just the growth of each business is not enough to understand the real impact that our methodologies have on their lives. 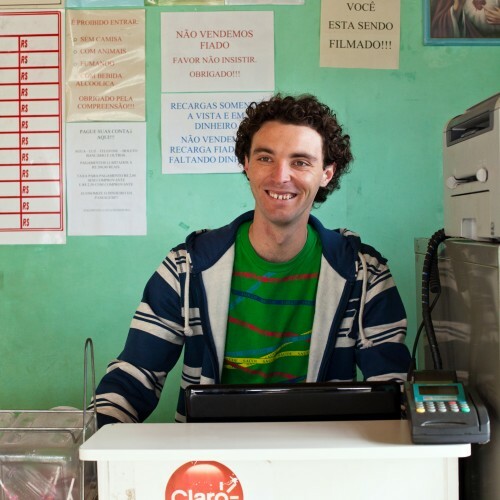 Every microentrepreneur supported by Aliança Empreendedora answers the Entrepreneurial Inclusion Index questionnaire twice: first at the beginning of the trainings and then at the end. This process enables us to evaluate their development in a thorough way. 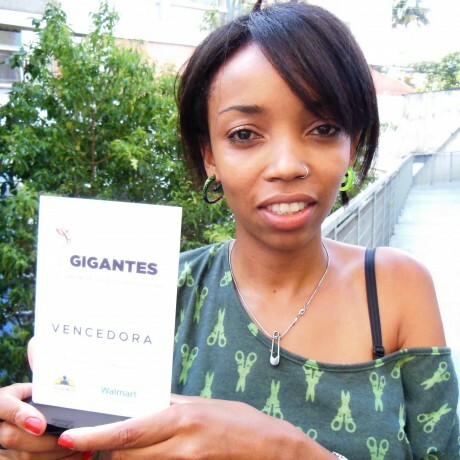 In 2013, Aliança Empreendedora won the Centennial Innovation Challenge, by The Rockefeller Foundation, with the Project “A Message for Freedom”. 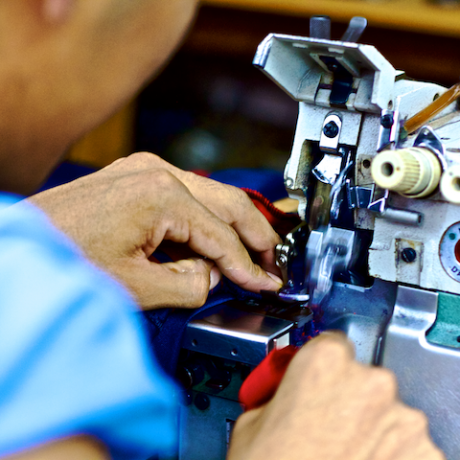 The project aims at strengthening entrepreneurs and fighting work in conditions similar to slavery in the textile industry in São Paulo. 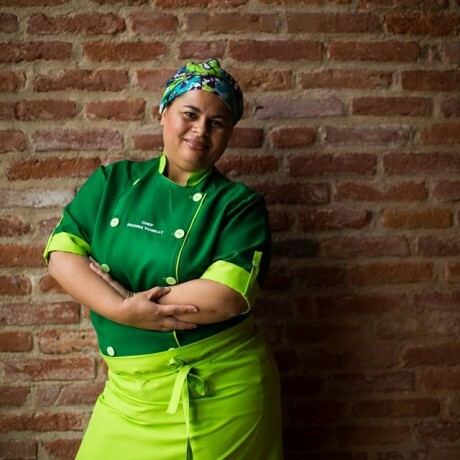 The award is an initiative of Aliança Empreendedora and Wallmart Institute and it has as its objective to identify, acknowledge, train and award women that own small businesses (yearly income of up to R$ 240 thousand) in São Paulo and its metropolitan area. The program is an initiative of Social Investment Department at Santander executed by Aliança Empreendedora since 2013. It has Santander Microcredit as its partner. The program has as its objective to identify, support, train and connect microentrepreneurs from low-income communities located in the cities where Santander Microcredit acts, so as to create more opportunities.